And it was, truly, a delicious salad, at least I thought it was. Sadly, I was pretty much alone on this one. Mark stalwartly tried some, but this kind of thing is not his favourite. The girls picked at the tiny mound I’d made on their plates. I looked at them all, hangdog expression, for gawd sakes BLACK BEANS ARE GOOD. And they are, at least in in my books. Gah! I used this recipe word-for-word. It combines so many of my favourite flavours; cumin, avocado, lime, cilantro. This, my friends, is what they serve after you die, at the Heavenly Buffet. This salad is divinely delectable. I ate the whole bowl (throughout the week, not in one sitting. I swear). Share the post "Will they eat it? 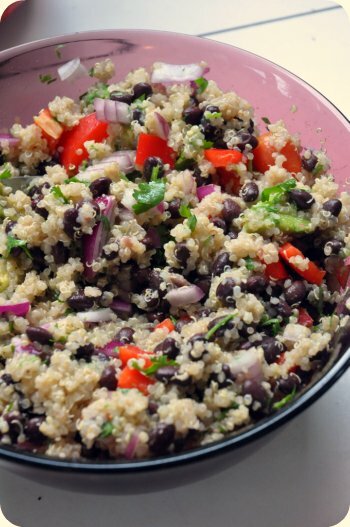 Quinoa salad with black beans, avocado, and cumin-lime dressing"
15 Responses to "Will they eat it? Quinoa salad with black beans, avocado, and cumin-lime dressing"
I need a serious lesson in how to cook quinoa. I’m terrible at it, and it always ends up tasting like nothing and with the texture of fluff. At least, when I cook it. I know people who swear by it…I’m just not one of them. I will try it! I’m looking to test more vegetarian food since I find it usually is not well received in my house. Tofu hotdogs…yuck! My littlest calls it ‘Toad Food’. Canadian Living…to die for…unfortunately not well received by the little people though either. I’m with you. I’ve made a very similar dish. Same reactions from better half and kids. Oh well, at least I have a kindred spirit somewhere ;) My black bean soup gets a much better reception (probably has something to with the thick crusty bread it is served with). Great minds think alike? I just posted about quinoa salad today…yours is on my list to try. Kaitlin, I talk about how I cook the quinoa in my post. It took me a few tries to get it right, because if quinoa is not soaked or rinsed well, it will have a funny taste. 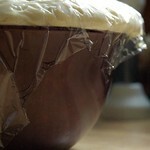 The method I use now seems to work for our family and the qunioa’s taste is more nutty than sour or ‘funny’ tasting. Well, if they won’t eat it, I will! Looks delicious. Yum, I will definitely try this. It has all of my favourite things too! Thanks for sharing it! Oh! I love quinoa. It makes wonderful salads and my kids love quinoa salads, quinoa as porridge, quinoa muffins, just quinoa. But, they do call it cous cous. First I thought about correcting them, but then I thought, they can call it whatever they want as long as they eat it, and so that was that. We have a lot of ‘couscous’ at home basically. The thing about quinoa is you have to rinse it (and shake it in the water) at least three times before cooking to remove the natural pesticide that it contains, which is bitter. I cook with a knuckle more of water (that is, I pour quinoa in the pot, add water until there is a knuckle’s length worth on top), put on high until boiling, then on just above simmer until fluffy, takes about 20 minutes. 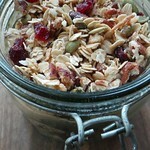 I often make a big pot at the beginning of the week and keep it in the fridge. Then grab bits to mix it with chickpeas and crunchy veggies, make a quinoa tabouli with parsley, cucumbers and tomatoes, heat it in the microwave then add some nuts, seeds and almond milk for breakfast, top it with sauted or steamed veggies, garlic and olive oil for a snack, throw a cup into some muffins. 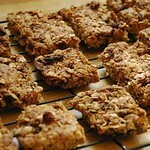 The possibilities are endless, it is so versatile and so nutritious, probably my favourite (non)grain! See now this is the kind of meal I really crave, yet hate the taste of. I’m sure I’m an oddity, but I do actually crave foods I don’t like and this salad/meal/side dish has nothing in it I actually like the taste of, but I really, really, really want to like it. Sigh. My kids love quinoa – so does the husband. I think the trick is to sweeten up the ingredients a bit to appeal more to kids’ taste buds. My kids don’t like anything curry or cumin flavoured, but I frequently make a honey lime dressing, or a lemon honey dressing, add some dried cranberries in addition to your veggies and see if you get the same reaction. If your husband’s a carnivore, nothing may work, but my kids eat it regularly and I make it in big batches so the oldest one can take it to school for lunch. I definitely want to try this! And thanks Carla for your tips too!